Under 30 minutes and just one pan. Winning combo, right there. I don’t do shrimp often since it’s hard to get wild-caught at a good price (and farmed shrimp are one of the worst seafood choices) but TJ’s has a 1-lb. frozen bag of wild-caught for just $10 so I’ve been picking that up occasionally. I opted for grass-fed creme fraiche to get the creamy consistency, which is a great dairy option due to the short ingredient list (it’s just cream) and the fact that it’s cultured (probiotics! plus lower lactose). Second best option IMO would be cashew cream (ratio of 1 part soaked cashews to 1 part water blended until very smooth) and then lastly, coconut cream. And I feel like someone is gonna question the anchovies so let’s talk about it. If you haven’t worked with them, the smell will seem strong. Especially when they’re cooking down into the onions. But just wait until the whole thing is finished, I’m betting you won’t even notice they’re there. Just a faint salty umami, a bit like working with fish sauce. 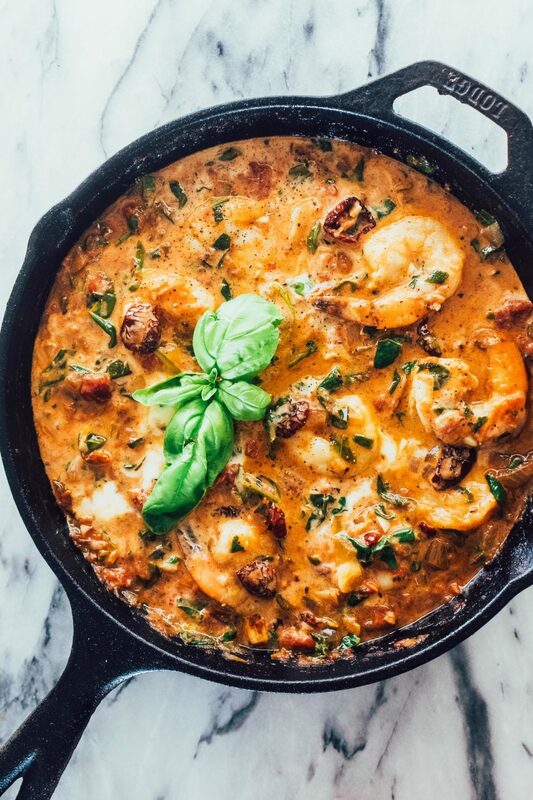 It’s a great pairing with the shrimp that helps offset the richness of the sauce. I served it mixed into a half roasted spaghetti squash, but any vegetable noodles would be great here. Note: for quick Instant Pot spaghetti squash, grab a copy of my Instant Pot for Beginners eBook over on the BRG Free Resources page! Heat a wide, deep skillet over medium heat. Once hot, add the ghee and chopped onion. Sauté until translucent, about 3 minutes. Add the anchovies and sauté until the start to break down and dissolve, about 3 minutes more. Add the garlic and sun dried tomatoes and sauté until fragrant, about 1 minute. Add the white wine and simmer a minute to cook off the alcohol. Stir in the canned tomatoes and bring to a simmer for 5-10 minutes to thicken the sauce slightly. Add the creme fraiche and bring back to a simmer. Remove from the heat and season with sea salt & black pepper. The anchovies will add a salty flavor so adjust the salt to your preference. I prefer the sun-dried tomatoes packed in extra-virgin olive oil. If you’re using the ones that are dried and packed loosely, add about 1/2 cup instead. Is there a substitute that I can use in place of the anchovies? Those little suckers are a trigger for my migraines, so I stay away from them. Sorry for the delay, Diane! I say just leave them out. I would suggest a splash of fish sauce but I think it’s pretty commonly made with anchovies. This was divine! So perfect served in a spaghetti squash half and I loved the lack of dirty dishes.